Gabriel Over the White House has been called one of the most bizarre movies of the 1930s. It is also the rare film that people will stress is notable but not many will say they actually liked. The movie focuses on a Depression-era American president who, following a car accident, appears to be possessed by an other-worldly spirit and is turned into a raging totalitarian dictator who ameliorates hard times by doing away with Congressional, and other, limitations on his power. Among many outrageous events, the film features a drive-by gangland shooting at the White House; a federal police force assembled to execute on the spot the Al Capone-like criminal who orchestrates said drive-by; and a scene in which the president threatens a group of diplomats gathered on board a yacht by ordering his air force to dive-bomb his own ships in order to persuade them (is that the right expression?) to make good on their wartime debts. These are but a few of the outlandish spectacles that Gabriel Over the White House has to offer. After a while (or perhaps immediately), this all becomes a bit hard to stomach. It is not an exaggeration to call President Judson Hammond a National Socialist of some kind. And yet the film overall seems to present Hammond’s fascist ways in an admiring and affectionate light. His secretaries, Pendola Molloy and Hartley Beekman, clearly are astonished and inspired by his transformation from a middling, corrupt, newly sworn-in president into a determined dictator. As the Library of Congress quotation above states, even though Hammond does away with treasured American principles of governance, he is also shown to accomplish a great deal, abolishing Prohibition, delivering a world peace accord, and single-handedly doing away with organized crime fostered by the likes of the film’s gangster antagonist, Nick Diamond. One of the movie’s odder moments is when Beekman attributes the president’s transformation to the angel Gabriel. Some time after Hammond’s accident and recuperation, Molloy presents the president with a speech that he has recently drafted. Hammond seems disoriented and does not recollect having ever written it. Then Molloy sees a fluttering curtain and a strange light, and suddenly the president remembers the speech as his own. Molloy confers with Beekman, who suggests that perhaps the president has become possessed by the spirit of the angel Gabriel, who is responsible for his transformed state of mind. 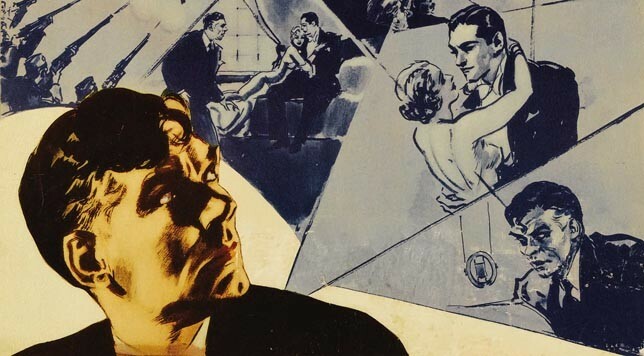 The film is reluctant to confirm Beekman’s hypothesis with any greater precision, but at the movie’s conclusion, when the president’s totalitarian persona disappears and he reverts to his former self, we see along with the secretaries the familiar curtain movement, breeze, and light. I think it is safe to say that when most people think of fascist dictators, the great angels of the Church do not immediately spring to mind, so the pairing is very strange. I should note that the film is based on the novel Rinehard by Thomas Frederic Tweed, which may shed more light on the bizarre connection between the divine and the political in this film (I have not read it myself). FDR was a fan of the film and was supposedly even allowed to contribute to its script, according to Jonathan Alter in The Defining Moment: FDR’s Hundred Days and the Triumph of Hope (2007); the movie was released two months after Roosevelt took office. Walter Huston, who plays President Hammond, resembles Roosevelt a bit physically, but fans of the real Depression-era president may not recognize much else of him here. For example, I don’t seem to recall learning either in high school or college that Roosevelt ordered his right-hand man to gun down gangsters in the streets. Still, to be fair to the movie, there is a lot of benevolent dictator rhetoric surrounding the Roosevelt legacy, and that rhetoric did not merely come about after the fact: at the time of Roosevelt’s inauguration, the New York Times ran the headline “FOR DICTATORSHIP IF NECESSARY.” There are always people who feel extreme measures are necessary to resolve difficult problems. Roosevelt was indeed an enormous proponent of using the federal government to bail the U.S. out of the Depression. It is laughable, however, to suggest that Roosevelt was dictatorial in the way that Gabriel’s President Hammond is. Hammond convinces the U.S. Congress to divest itself of its own powers of governance so that he can rule absolutely: Roosevelt was constantly held in check by the non-executive branches of government, which, much as he struggled with them, he never suggested should not exist. This is not a nice film to look at, and I say that as someone who has tolerated many bad, ugly monster movies of the mid- to late twentieth century. Dialogue-wise it is also difficult to sit through. The film features many long speeches that feel more like lectures rather than art. It’s a bit like a feature-length after-school special that Chairman Mao might have written. Strangely (I never thought I would come close to saying this), while watching it, I almost longed for the Leni Riefenstahl documentary Triumph of the Will, another film that worships the totalitarian mindset; I guess I can say at the very least that Riefenstahl’s film is more sincere. Yet I find my experience puzzling as director Gregory La Cava also made the wonderful and funny My Man Godfrey (1936) and Stage Door (1937). Maybe Gabriel Over the White House is a big joke that I just do not get.